New – CALF Vs NESCAF Smackdown Comparison. We compare the NESCAF switched capacitor filter to the CALF active op amp filter. I have a hard time concentrating on CW when multiple signals are heard at the same time. Maybe it’s due to my hearing impairment (Yes, even one eared I do play music and copy CW!). For me I try to copy everything I hear, high and low, which results in gibberish and missed characters. Just after creating my HW-8-LM386 audio amplifier, I met up on the HW-8 Yahoo reflector with Glen, KK4LPG, which re-introduced me to op-amp audio filters. Glen happens to be a wealth of knowledge in op-amp filtering and pulling in weak signals. The CALF (CW Audio Limiter Filter) project began as a simple way to improve the not-so-great filtering of the Heathkit HW-8. My first thoughts were to remove the LM3900 IC and replace it using a piggy-back PCB with better filters on it. The project began growing after looking at some of Glen’s ideas of adding a limiter (and LED display) to the circuit. So why should a limiter be in the circuit? There are many good reasons! Several great articles by N7VE discuss filtering and the need to add a limiter circuit to protect your hearing. This makes sense in saving your ears when you turn your volume way up to hear a weak signal only to go deaf from a large static crash. Although in this circuit the limiter is at the front of the circuit instead of just before headphones, it still helps. In relation to static crashes above – Take for example trying to listen to an S5 signal with a summer lightening storm a hundred miles away generating S9+10 static crashes. The storm takes the foreground while your signal takes a back seat. Now add a limiter in the circuit setting the limit threshold to just above your S5 signal. Anything over that, such as lightening crashes, is limited (think of it as cutting the positive part of a sine wave in half and squaring off the top). You still hear the crashes but they are now more like S5 or S6 crashes against your S5 signal… a level playing field! In a weak signal environment you can use a limiter to it’s limits so to speak. For example take a nice quiet day on 15M (no lightening, just background noise) and you hear a faint signal. Placing the limiter up until the background noise itself is limited may sometimes make that signal sound stronger. Maybe it’s a trick of the ears but it really does work! CALF on the breadboard – not pretty but works! So now at this point there is a limiter as well as bandpass filters on the protoboard. The gears started rolling with questions……. 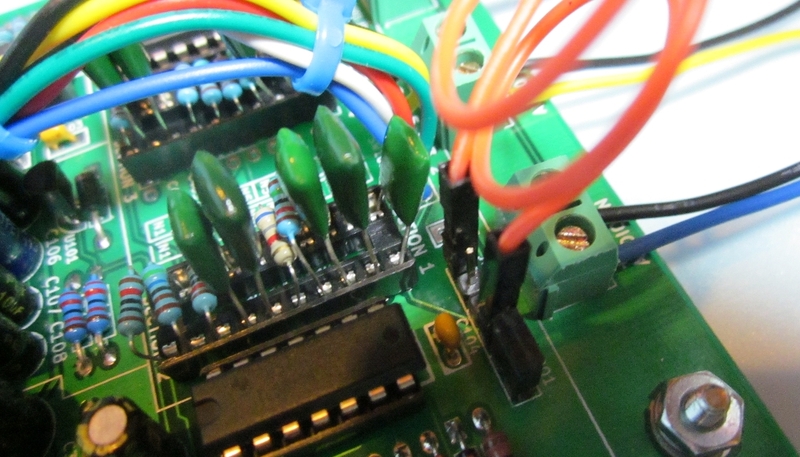 With those questions a decision was made to make it external to the radio, polish it up a bit with some input buffering and an output amplifier, and create a PCB for it to keep the project clean looking. Because I like to tinker with circuits I thought ahead and added a few other goodies to the PCB such as the ability to socket the R/C values to make different types of filters (High, Low, and Band pass!) and to add jumpers to be able to re-arrange the limiter and filters as needed. The power switch is also an audio bypass allowing the audio signal from the radio to go straight to the speaker/headphones when the power is turned off. 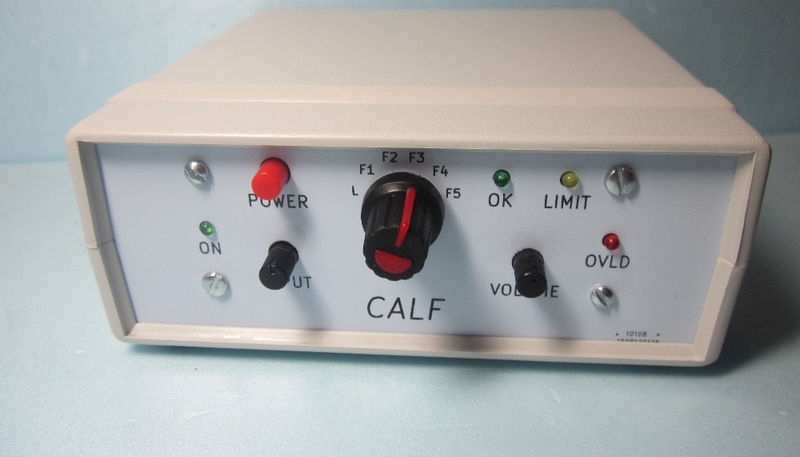 CALF kits and assembled units are available in the store. How does it perform? Well first I have a disclaimer….. Compared with one of my IC-725’s with a built in 250Hz IF filter, there is no comparison. An IF filter will easily outperform strong signal interference compared to any AF filter, even a DSP one. That being said, there are still plenty of reasons to use an AF filter. For many commercial radios cost is a big issue with IF filter prices going from $100-$250+! Other radio’s may contain an IF but a filter is not available (buy custom Xtals and roll your own!). 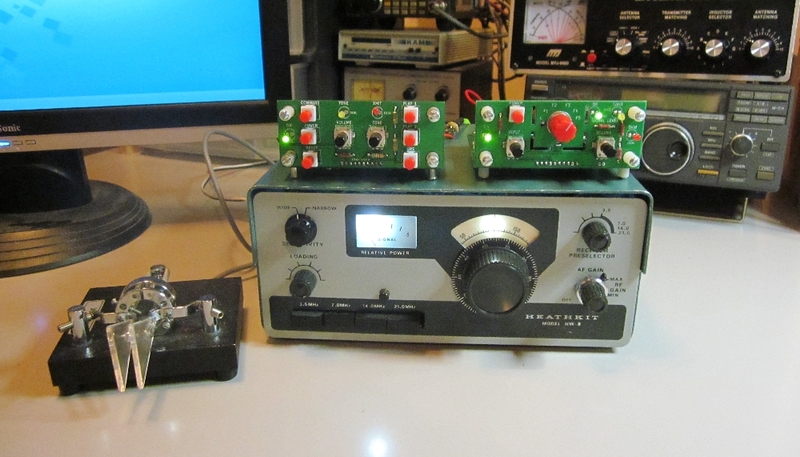 Yet for many QRP type radio’s, such as the HW-8, there is no IF to filter. In these cases an AF filter is better than no filter at all! Personally I prefer the sound quality of CALF over my IC-725 narrow IF fiter. <100Hz   Measured as  79Hz with a 41db/octave roll off - A little too narrow to tune with the HW-8 unless tuning with a lower position first. However once tuned worked great! Example of working with High and Low pass circuits. Section 1 is High pass, Section 2 is Low Pass. The resulting plot shows each filter along with combining them in series. Note in the picture we used a jumper to bypass stage 1 for a stage 2 only measurement. In this test the center frequency was 1200Hz. Want to design filters for the CALF? Check out the TI FilterPro cheat sheet page. Sometimes I get a request for a specific bandwidth or center frequency, so at the bottom of this page I will post values for requested settings. Interested in experimenting or need a nice filter? Kits are available and can be found in the store. CALF now has an enclosure but here are a few pictures getting from point A to point B……. CALF & 3CPO will run on batteries (for example 9V or a bank of AA/AAA’s). It’s recommended to be closer to 12V or to use at least 6-AA’s. Connect the battery positive (red) to the positive power terminal on the CALF/3CPO. Connect the battery negative (black) to the middle unused power jack terminal. This connection is normally shorted to ground when nothing is plugged in and will open (disconnecting the battery) when external power is plugged in. For the battery I usually find the 9V & AA/AAA battery holder wires to be real thin & fragile. If you use the terminal blocks then you may need to solder a small piece of wire (or a clipping from a part lead) to the battery leads so the terminal block has enough to clamp down on it. You may also want to use the mounting hole next to the power block along with a small cable tie to secure the battery wires down and keep them from breaking. Refer to the schematic for node numbers – Values in red indiciates parts NOT in the original CALF filters. 1% resistors are preferred. Note the last 3 stages are all Q=5 causing steeper skirts.